The global market for automotive air filter consists of a large number of market players which explains the high degree of fragmentation within the market. A peculiar trait of the competitive landscape is the large market share held by the small market players. This is because the demand for air filters at local service stations is higher than the demand experienced by certified workshops or service centers. The small market players have attained a strong position in the market by maintaining a regular inflow of supplies to cater to the year-round demand. Furthermore, the sheer abundance of local service stations has given an impetus to the growth of the local players in recent times. There are minimal barriers to the entry of new market players which is expected to further fragment the global market. The large market players are expected to acquire the regional players in order to expand their geographical reach and reap the benefits of greater market penetration. Besides this, the medium-sized players are expected to form strategic alliances in order to avert the strong competition from the huge market vendors. Mergers and acquisitions are expected to be a key strategy of the players operating in the global market for automotive air filter. Sogefi SpA, MANN+HUMMEL GmbH, MAHLE GmbH, A.L. Filter, Donaldson Company, Inc., and Robert Bosch GmbH are some of the key players identified in the global market for automotive air filter. 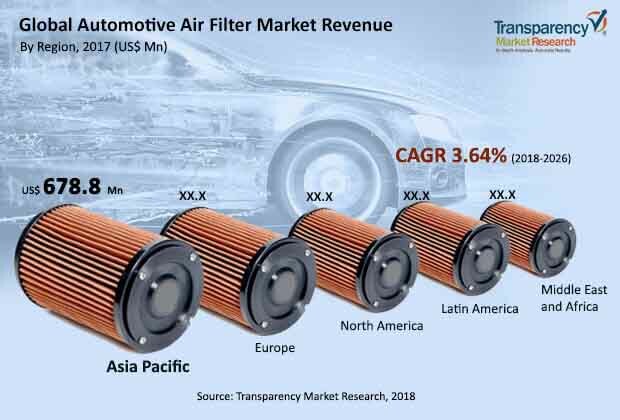 The global market for automotive air filter is estimated to expand at a steady CAGR of 3.5% over the period between 2018 and 2026, finds Transparency Market Research (TMR). Based on geography, the demand for automotive air filters is expected to escalate at a swift pace across Latin America. The automotive industry has been expanding at an astral rate over the past decade which has boosted demand within the global market for automotive air filters. Furthermore, the collective impact of increasing vehicle fleet size and rising purchasing power of the masses has fortified the global market for automotive air filters. Moreover, environmental concerns have also necessitated the installation of better-performing air filters in automobiles. This factor, coupled with the regulations stipulated by the government, has accelerated the growth of the global market for automated air filters. Besides this, air filters ensure that the engine of automobiles is immune to external debris or dirt and the air-fuel mixture is maintained. Improper functioning or absence of air filters can affect the ignition system of vehicles which could in turn harm the engine. Owing to the aforementioned factors, the demand within the global automotive air filters market is expected to trace an upward graph over the coming years. The global carbon footprint has raised concerns about the protection of the environment and has led several industries to invent green ways to avert the abysmal situation. The automotive industry has been a huge contributor to the total carbon emissions, which has given birth to electric vehicles that do not require air filters. As electric vehicles gain popularity across the globe, the market for automotive air filter may suffer hindrances to growth. The review is based on TMR’s titled, “Air Filter Market For Automotive Industry (Filter Type - Engine Air Filter, Cabin Air Filter; Material Type - Paper Air Filter, Cotton Gauze Air Filter, Foam Air Filter; Vehicle Type - Passenger Vehicles, Commercial Vehicles, Electrical Vehicles; End use - OEMs, Aftermarket) - Global Industry Analysis, Size, Share, Growth, Trends, And Forecast 2017 – 2025”.